When summer finally rolls around here in Colorado, the last thing you want to be dealing with is a broken air conditioner. As such, it’s important that you take care of the majority of your HVAC checklist before that — during the spring. Although we will repair or replace your HVAC system no matter the time of year, we highly recommend getting everything sorted out while the weather is still cool and spring tends to be the best time to do that. If you have any questions, or you’re looking for AC repair services in Fort Collins, Loveland, Longmont, or anywhere in northern Colorado, don’t hesitate to contact Buckhorn Heating & Air. The air filter on your HVAC system does more than simply trapping airborne contaminants, it helps ensure your system is running efficiently and that it’s not working any harder than it needs to. Air filters that are clogged with hair, dust, and other fine particles will do you no favors and most likely significantly increase your monthly energy bills. Another reason to check them is because you may be using a filter with too high of a MERV rating meaning your air ducts will get clogged quicker. Spring is the perfect time to change these because it’s a transition period between colder winter months and the hot summer. Your air ducts affect your HVAC system in much the same way that your air filter does. If it’s not clean, your system will run less efficiently. Although many homeowners find it tempting to do their own duct cleaning, we highly recommend calling an expert who can get the job done quickly and without damaging any other part of the system. They’ll also check to make sure everything is insulated correctly. There are a lot of different things on your HVAC system that can be upgraded from your thermostat to the actual system itself. If your air conditioner is on its last leg, you may consider replacing it even if it’s still functioning. This will ensure that when the hot summer weather hits you won’t be left with a broken system or one that’s less than optimal. If you have a normal thermostat, you may consider upgrading to a programmable thermostat. These thermostats allow you to save more money on heating and cooling by allowing you to schedule out your heating and cooling periods rather than doing it manually every time. Ultimately, your first step this spring will be to find the right HVAC company. 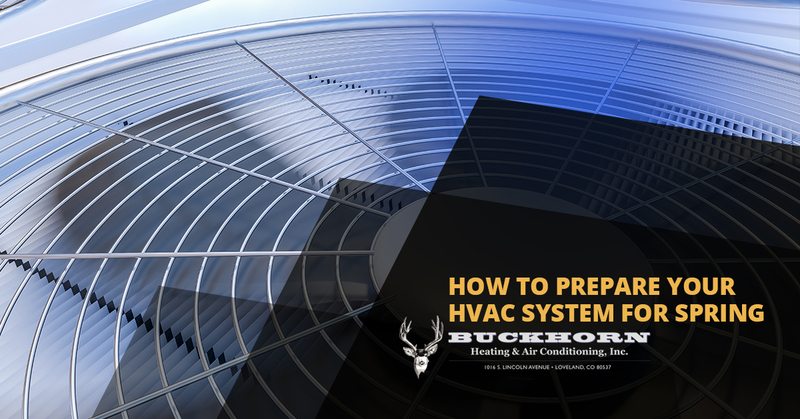 Even if you’re not quite sure if you want to have anything done on your HVAC system, you can consult with an expert or have them inspect your system to scout out any potential issues. Here at Buckhorn Heating & Air, we have years of experience serving northern Colorado. Give us a call today for a free consultation or visit our site to learn more about us.